Offspring the first has been raking in the handknits around here recently. First a sweater, now a blanket, and coming up, a skirt? Sheesh! Boo is going to feel left out*. A handspun, handknit shawl blanket from her Mama for Devil. 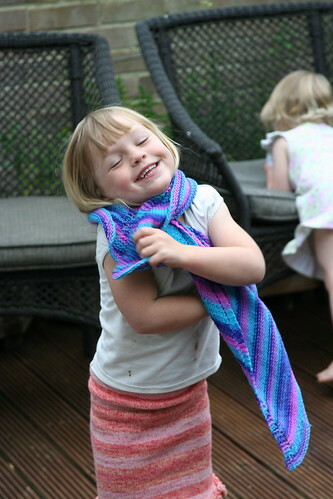 A totally made up pattern, US 6 needles (4.0 mm), 4.5 sts/inch, one ball of the two we had after our dyeing/spinning experiment, and one happy little girl. What fun. I cast on ten stitches, worked three rows in garter stitch, and then started the increases. First increases were k3, yo, k4, yo, k3, then on the wrong side, k3, p1, k4, p1, k3. After that I increased 4 stitches every right side row by yo after the first 3 stitches, before the middle 4 stitches, after the middle 4 stitches and before the last 3 stitches. 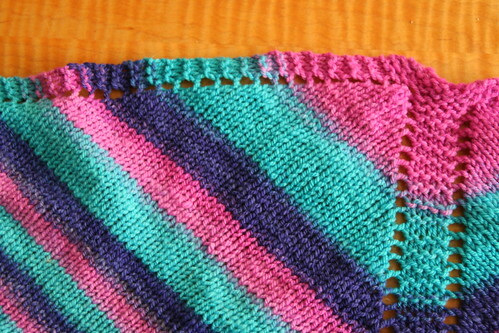 Those stiches were worked in garter stitch throughout, and the new stitches were worked in stockinette. * Thankfully Boo is, per usual, busy with her own thing and completely unaware that she is missing out. I'll make it up to you baby. 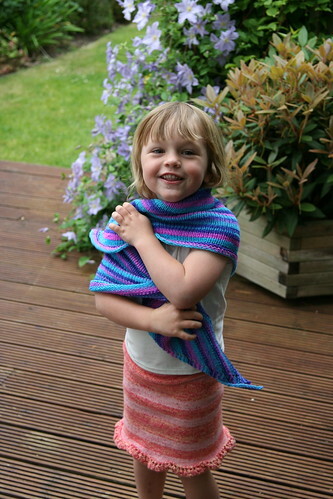 Written by porpoise On June 26, 2009 In "Devil", "FO", "blanket", "designs", "handspun"